Philips teams up with Dixons to bring Android docking stations to the UK | What Hi-Fi? 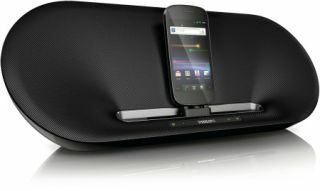 Philips is bringing its Fidelio range of docking stations to Android owners through selected Currys and PC World Stores. The new Philips Android docking range offers a choice of three models: 'room-filling' sound from the AS851 (above, £199), music for the home or on the go with the smaller battery- or mains-powered AS351 (below, £129), and an alarm clock dock, the AS111 (£70). All three offer 'dock and play' functionality – similar to that of Apple iPod docks – thanks to a special micro USB connector that can be adjusted to different positions to suit different types of Android device. As well as docking and charging, the docks automatically fire up the dedicated Philips Fidelio App for Android when a device is inserted – linking via Bluetooth if necessary – so pairing the mobile to the dock for instant music replay.